Check out three gorgeous nail art looks which are sure to make you look cool this winter! Nail art is so much fun! During winter months, the best way to break the monotony and boring dullness caused by shades of gray and black are to paint your nails. With some awesome ideas on how to create perfect, gorgeous and professional nail designs you can actually aim at looking quite a star at the social gatherings. Learn some of the amazing tips and tricks to perfect the art of nail art designing which will surely leave your friends screaming with envy. Nail art look based on the stamping technique looks difficult to most beginners. But the truth is that it is easy-to-do! You could try this look at the comfort of your home without going to the nail salon. Start by creating this design using nail stickers. Once you have become a pro at it, you can aim at achieving the perfect nail art design purely based on the stamping technique using appliques. This nail art technique primarily involves transferring designs in nail polish to your nails using a ready-made metallic plates (with designs on them). All you got to do is stamp it on your nails carefully using the nail polish color of your choice. Easy! Isn’t? One of the best ways to achieve an awesome tie-dye effect, marbling technique is a chic way to amp up your beauty quotient. Having said this, It’s not a quick process. Besides, it can also get messy. But, girls- if you want to have some fun on a pajama night party, then go creative and paint your nails using this technique. Some of the starting steps are simple, from applying a base coat to your nails to protecting your fingers using petroleum jelly, these are basics. Now, in a small cup – fill water and select minimum two nail polish colors (contrast colors). The marble effect uses a lot of nail polish, so stick to old bottles (old polish tends to set too quickly) or the cheaper ones. Now mix a drop of one color on the surface of the water and let it spread out a little across the surface. Let it not stay clumped in the center. Repeat the same activity with the second color. Make sure to throw a new drop right at the center of the first circle. Now, with the help of a toothpick tip (move it spirally around/on the colors), drag it through the colors to create patterns of your choice. You must do this really fast or the purpose is defeated! 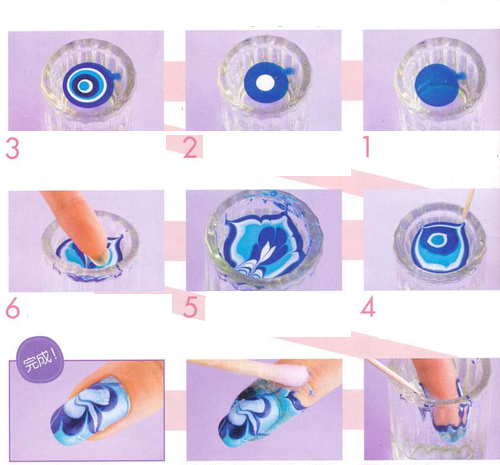 Now hold your nail in the pattern and lift it out gently to achieve the desired effect. Looks lovely, isn’t it? Polkas can never go out of fashion. 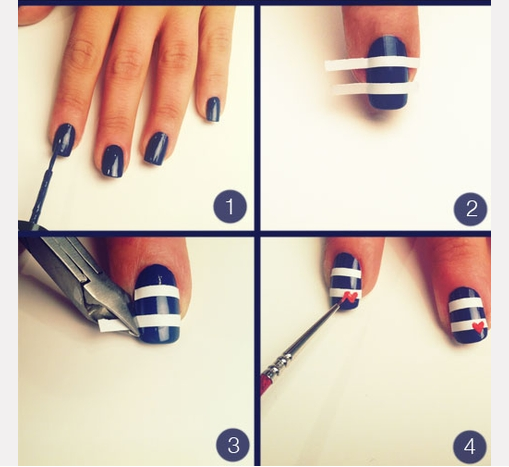 Give your nails a splendid twist by using a hairpin. That’s it! Be it small colorful dots or big monotone ones, just add some funk in your life with this awesome nail art look. There are different types of polka dot designs to go with your outfits, moods, and occasions. What’s more? 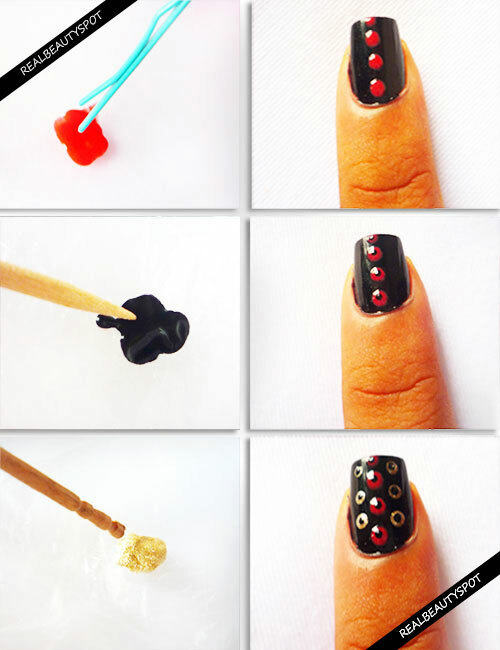 Polka dot nail art designs are easy-to-do and require very little time. You just need to play with colors! Apply a base coat of your choice and let it dry. Pick up another polish color (in contrast) and apply polkas of this color using the hairpin. You could also use a toothpick for the desired effect! Some classic color combos are orange on white, black on white, black on yellow, and silver on blue!